This was a fantastic tour! We went to some smaller vineyards which made the tastings more intimate. Skip, our tour guide, was funny, knowledgeable, and made the day truly enjoyable. I accidentally left something on the tour bus after he dropped us off at our hotel, and he went out of his way to return it to me at my hotel on his own time. I highly recommend this tour - you'll love it! Loved the tour! We had a great tour guide and the vineyards were amazing! Thanks. Really great day out. Visited three vineyards and sampled some great wines but that wasn't the highlight. Dylan, our guide, was knowledgeable, approachable and, more importantly, an absolute riot. Fantastic vibe amongst the group which was held together by Dylan's singing, story telling and appalling attempts at our various accents. If you've got a spare day in SF, do this tour and, if you're lucky, you might get Dylan and his really dodgy English accent! Chris was very knowledgeable about San Francisco, Sonoma and provided interesting information about wine, how it is grown and the best way to taste. My daughter and I didn't have much sleep the night before but Chris was able to get us out of our funk with his hummer and uplifting personality! We got way more for our then anticipated! Loved the smaller group experience. Katie was our tour guide. This was our second winery trip within one week Napa was first. The wineries on both tours were similar...not sure if it would have been better to do it all in one day??? the benefit of the two full day tours was an entirely new group of people. The folks on this second tour were more outgoing, chatty and fun. Dylan, our guide, was entertaining and knowledgeable, but we were disappointed with the first two wineries. At the first we felt it was rushed and they couldn't wait to get us out the door. It was also cold and difficult to hear because of another group and their host. The wines at the second were mediocre, but a pleasant location to enjoy the good lunch provided by the tour operator. The third was by far the best both, in terms of the venue and the quality of the wines. The host was interesting and was not pushing us to buy wines - they would sell anywhere. Great tour. Hits a few wineries, but you get to truly enjoy each one. Relaxing trip. Tour guide was very knowledgeable and entertaining. Excellent tour. We were picked up from our hotel and there began a wonderful day. 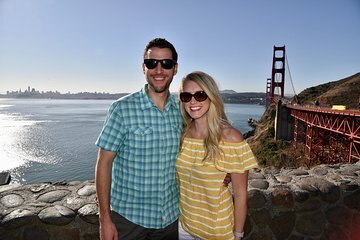 A photo stop at the Golden Gate Bridge, and we were on our way to Sonoma. Visited three different wineries. All had their own characteristics. Great ambiance and great wines. Our guide, Mark, was very knowledgeable on all aspects of the wine making process. Very entertaining and familiar with the wineries we visited.